For a child, they say their schooldays are the best days of their lives. But for the parents, they are fast becoming the most expensive days of their lives. 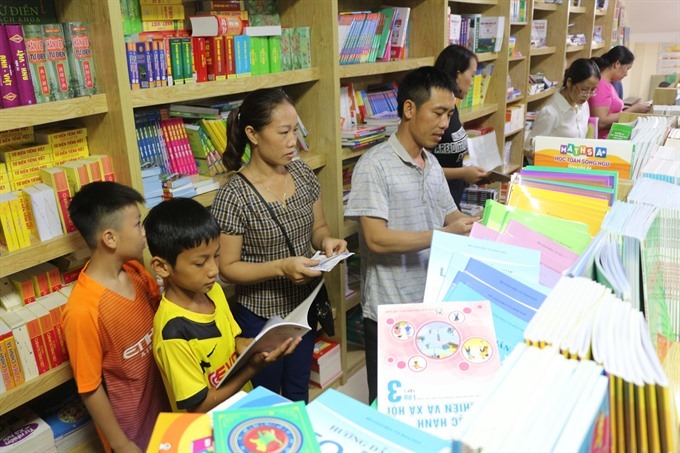 Parents buy new textbooks for their children at a bookstore in the central province of Nghe An. Every parent wants the best possible education for their children, but at what cost? Earlier this month, it was back to school time for many youngsters countrywide. Excited and full of energy, my daughter was back in her classroom raring to go. A new school year means new grade, new uniform, and new text books. For the past five years, this is the time of year I have to dig deep not only for the books, but other supplied much needed to ensure she gets a first class education. Last term’s books should be recycled for a good cause, and packed up and sent off to those youngsters in need in remote areas of our country. Sadly this is often easier said than done. After a school year, fetching and carrying those books to and from school, thumbing them everyday, most, if not all, are in no fit state to pass on. In most of the main subjects, like Vietnamese, maths and writing, textbooks and workbooks have questions and allow children to write their answers in. And most of that 20-cm pile of one-time-used books ended up with being sold to scrap collectors with a price of VNĐ2,000 (8 US cent) per kilo. This made take a trip down memory lane some 30 years to the time I went to school. My educational tools back then were often inherited from brothers and sisters, cousins and neighbours. Hand me downs maybe, but still books that were cherished, looked after and in nearly new condition. Back then, many families would struggle to splash out on new books year in and year out, but it hardly mattered as most of what was taught each year remained the same. Education has no doubt improved greatly over the past 30 years and the idea of reusing books passed down over and over again is a distant and fading memory. Today the children simply write their answers into the books. On one hand, I’m not denying this is convenient but on the other, is it a waste? Each year, it is estimated parents spend VNĐ1 trillion ($44.4 million) on text books with most, if not all, ending up in a trash, waiting for the scrap man to arrive and buy them back at a fraction of the original cost. Elsewhere in the country as children head to school along muddy dirt tracks instead of concrete roads, they are arriving in class with nothing to learn from. According to the 2017 report of the Viet Nam Publishing House, the only supplier of official textbooks, this year they will supply 104 million copies. No small figure. And when you add in the amount printed in previous years, 2017 (107.8 million), 2016 (108.8 million) and 2015 (101 million) you wonder are they actually printing books or printing money? Text books account for more than half of the entire publishing industry. In fact, more text books are printed than daily newspapers. Other statistics reveal that in 2016 the amount of textbooks issued by Viet Nam Education Publishing House accounted for 56.4 per cent of the entire industry. In 2017, this figure was 50.4 per cent. Nice work if you can get it, but is it really necessary? It is also a headache for shopkeepers as well as parents. I spoke to one who told me that each year they are left with a surplus stock that’s as much use as an ashtray on a motorbike because of the changes made to the latest edition. Textbook innovation is a natural part of the education industry with the means to provide the most up-to-date knowledge for learners, that’s what I want and that’s what all parents want. But is the content changing for the good of the child or is it simply change for changes sake? Stop for moment and think about this as well. More books means more paper. More paper not only means more rubbish but it means more trees destroyed, more forests pillaged and more harm to the environment. That may not be of a great concern to us but it surely will be for our children and our children’s children. Replacing textbooks is also extremely costly. We had to use official development assistance (ODA) source to renovate textbooks in early 1990. In less than four years, we again had to spend billions of dollars in the form of ODA loans for education. So far, the textbooks situation has not been stable. Educators are still debating on renovation and textbooks can be replaced at any time. But let’s get to the end chapter here. What’s key is knowledge, that’s what children strive for and that’s what we, as parents, hope beyond hope, our children leave school with an abundance of.